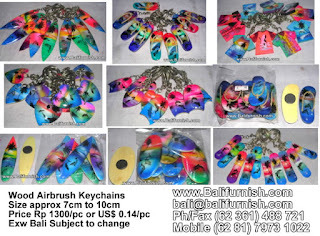 Airbrush Keychains from Bali. Key chains made of wood with air brush paintings from Bali. Souvenirs made in Indonesia. Available in various sizes and motifs. We have many motifs which is already popular, you have seen this in many gift shops such as beach, dolphins, coconut trees and all beach theme and tropical style.